Traveling can be described with many adjectives….fun or stressful, entertaining or uncertain…and there are always elements of anticipation too, as you ready yourself for the journey, trying to remember to pack everything and to leave nothing behind….but sometimes travel takes unanticipated turns and you find yourself in unfamiliar territory and at the mercy of others. Such was the situation that I found myself in as my family and I departed for yet another trip to another state for another wedding this weekend. My trip to the North a few weeks ago was smooth and uneventful; this trip would not be quite the same. Friday morning on the 10th of June, we arose, finished packing, loaded the car, dropped the dog off at the kennel and hit the road, making a short run at the drive-thru for breakfast and coffee. We breezed through the largest obstacle, Atlanta, with relative ease and once north of the city, we made good time for the next hour and a half to obstacle 2, Chattanooga, Tennessee. Chattanooga is not nearly as large as Atlanta but its interstate system is very old and antiquated and one doesn’t expect to make good time through it. Today was no exception as we meandered around the city in the company of what seemed to be hundreds of tractor trailers who didn’t care to observe the “trucks keep right except to pass” rules. On top of that, there were dozens of antique roadsters heading somewhere in the same direction we were going and they were spread out over several miles and topping out at 50 miles per hour so this was creating more than the usual traffic problems. Eventually we seemed to get ahead of the trucks and roadsters and began to make decent time again. I noted with satisfaction that we were staying within schedule parameters and should arrive in Russellville about the time of day I had hoped to. About ten miles north of Kimball Tennessee, our thoughts turned to lunch and we began to discuss where to stop to eat when my schedule and our trip took a much unexpected turn. I should have known it wasn’t going to be a piece of cake and as it turned out, it was a piece of rubber that did us in. Traffic was moving swiftly along, if somewhere tightly packed, when all of a sudden, the car in front of me swerved sharply to the right. All my reflexes engaged instantly but not fast enough to avoid the large, long piece of tire tread that lay squarely in front of me and at interstate speeds could not have been avoided anyway without putting my family and other vehicles around us in danger. We struck the tread with a loud bang and everything began to go wrong at once. Houston, we have a problem. To some very small degree, I now have a sense of what a pilot might feel like when faced with a situation where his aircraft has suddenly been damaged and nothing is working right. The Buick felt crippled and was losing power suddenly. I pushed harder on the accelerator while still losing speed and felt the engine trying hard but then I noticed that lights had come on in the instrument pod and one of them was an engine light. More ominous was the message that appeared below it that read something like “Engine Failure: reducing power to avoid damage”. Cars were all around us and a narrow strip of land no more than 40 feet wide lay to our left, between us and the other lanes of traffic going in the opposite direction. Many thoughts go through your head and like a pilot making an emergency landing, you have to think of the safest thing for everyone. I didn’t think the car could limp along much longer so I spotted what appeared to be a flat enough surface just off the pavement and made for it, noticing now that the Enclave was bucking like a horse and getting slower by the second. I managed to get the car just off the interstate into the grassy median and the instant I put the car in park, it shut itself down. I was barely more than three feet to the left of the white line that marked the outer edge of the fast lane on I-24 and the emergency lane consisted of that three foot wide strip of asphalt. At least we were off the interstate. It was then I smelled the distinct aroma of fresh gasoline. Not good. I told my wife we needed to get out of the car fast and I jumped out, threw open the back door and hauled my son across the back of the car and out while my wife climbed over the console in the front seat to come out my door. The aroma of gasoline was overpowering and seemed stronger outside. I told my family we needed to get away from it and walked away from it in the direction behind it. My biggest concern at that point was knowing that there was a serious piece of tire in the road just behind us and another swerve might bring an additional vehicle too far over that could strike our vehicle and send it heading straight for us or worse, it could explode. We moved back about 25 yards from it to where we felt safer and then I called OnStar from my BlackBerry. I could have pushed the button on the way out of the car but I just didn’t feel we had time and I wanted my crew safely away from it. OnStar came on the line and I notified them of what had happened and requested help. They got right on it. It’s not fun to be stranded at all, especially in the median between two very busy sets of interstate lanes, in 95 degree weather and with the noon sun directly overhead-plus a seven year old. We didn’t have to wait long before the first wave of our heroes for that day arrived in the form of two Tennessee Highway Patrolmen on motorcycles. We told them what happened and they said we were right to move away from the Buick and go where we had gone. The Sergeant moved closer to the vehicle and checked carefully under it and determined that the fuel was not leaking anymore and asked us if we had a tow truck in route. OnStar had just called back and told us one was on the way with an estimated arrival time of 90 minutes. The trooper said there was a local Buick dealer just back down the interstate in Kimball and he could call the towing company that they used and probably get them there a lot faster. He made the call and I called OnStar back and told them to cancel the other tow truck. 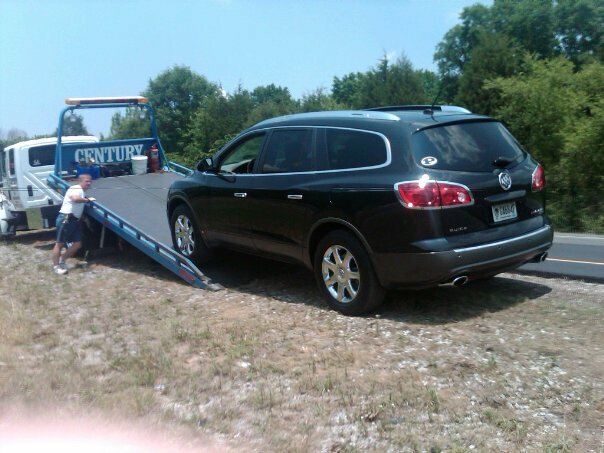 The OnStar operator had already made arrangements with the Buick dealership to be ready to receive our vehicle but was able to stop the other tow truck before it got too far on its way. Meanwhile, the other trooper entertained my son and pretty soon they were engaged in a lively conversation about dogs. This went on a few minutes and then we heard a long, shrill noise as our next two heroes arrived in a yellow fire truck. The wailing siren fell silent as it came to a stop and two men got out of the truck and headed our way. The younger gentleman was probably in his early 60’s; the older one was likely in his upper 70’s. I wondered in my head if I could remember how to operate a pump on a fire engine after all these years should the Buick suddenly decide to go up in flames. My thoughts were unnecessary and also out of line. We explained what happened and found out that OnStar had called them because I had told the operator we had gas leaking from the car. 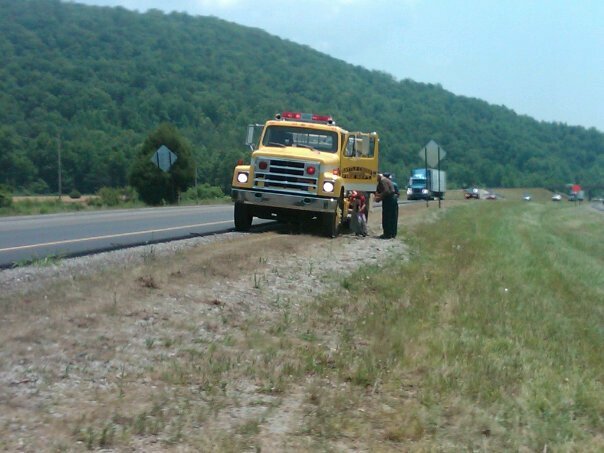 The troopers had another call holding and the men of the Battle Creek Volunteer Fire Department of South Pittsburg, Tennessee told them they would stay with us until help arrived. The older gentleman, who I think I heard referred to as “the Chief” by the younger one, checked to make sure we were ok while the younger one, who I suspect might have been a vehicle mechanic, headed over to the Buick and started checking things out. The chief (I’m going to call him that from here) told us to come stand by the yellow fire engine and get out of the sun and he took us over to the older but very well cared for apparatus and helped my wife and son up into the rear facing seat and out of the direct light. He then opened a compartment and handed us all bottles of water. Warm water never tasted so good. He asked us about the tow truck and I told him one was coming and it would be towed to the Buick dealership in Kimball. The chief said “that’s good; Big Jim will take good care of you”. Meanwhile, the younger of the two came back and said he’d found the problem with the car (I had observed him crawl under the vehicle while the Chief was handing out water) and he wanted to show me what was wrong. We went over to Buick and he got back down on the ground and I got down there with him, though not nearly as easily as he did. It turned out the tire scrap had struck something he called a sending unit and had broken it and this was the part that I guess metered gas from the tank to the engine. He said the dealer should be able to put a new one on with no problem and we could get underway again. As we waited, I asked him about their department and he told me it was all-volunteer and that they served a large section of this county alone. I told him of my prior background in the volunteer fire department back home, after which we talked shop, covering everything from emergency management since the 9/11 events, the difficulty in finding volunteers these days to making do with whatever equipment you could scrounge up. 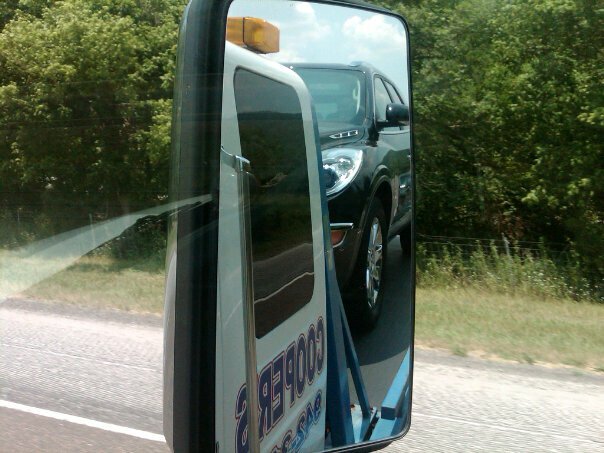 We didn’t even notice that the tow truck had arrived and had pulled forward of our Enclave until we heard the flatbed disengage and begin to lower. We thanked them for all their help and had to make our son give back the fire helmet the Chief had loaned him to try on. A little while later, we were on our way to Kimball in an air conditioned flatbed wrecker that was an oasis of cool after broiling in the sun for over an hour. We arrived at the Buick Dealership where our car was offloaded right into the service bay and made our way to the waiting room while they checked it out. Gentry Chevrolet-Buick-GMC had a lot of history to show off and rightfully so; it turned out they were now the oldest GM product dealer in that part of Tennessee that had been in the hands of one family, as attested to by the multitude of newspaper articles, awards and photographs that adorned the wall of the waiting area. They were founded in 1929, the same year as my family’s barbecue restaurant and had been going every since; 82 years so far. The service manager came in after about an hour and told us that our mechanical firefighter had been right about the fuel sending unit but that the source of the gas leak was also the fault of a fractured fuel line, a pressured gas line that fed fuel to the engine and this part had to be obtained from Michigan. Tuesday would be the earliest it could be fixed but fortunately, a national rental car company had an office just down the street that did business with Gentry and he we could get a rental car to get us to our destination in Kentucky. While we were waiting, our third hero for the day stopped by to meet us. Mr. Jim Gentry, owner of the dealership, has been selling cars at the dealership founded by his father since he was 15 years old and he has a thriving car business in Kimball. It was easy to see why because if there is one thing a Southerner can recognize, it’s a true Southern Gentleman. Friendly, affable and outgoing, Mr. Gentry wanted to know if there was anything we needed and then asked us where we were from and where we were going. We told him what had happened to us and when I said we were from the Atlanta area, he wanted to know if we were Georgia Bulldogs. When you are stranded in and at the mercy of people from a state that is one of UGA’s major rivals, you aren’t sure whether that is a question you want to answer or not but given the University of Georgia license plate on the back of the Enclave and the big oval “G” on the vanity plate up front, I couldn’t exactly avoid the question, could I? I told him with pride that “yes we are” and he answered “So am I. I went to Georgia and I’m bulldog born and bulldog bred and when I die I’ll be bulldog dead”. We had a nice chat and he told us that the rental car company had been called and that they would be giving us a discount because he sent a lot of business their way. He also told us his people would get our car fixed up and get it back to us just as soon as they could and if we needed anything, to give him a call. I just might travel to Kimball the next time I’m ready to buy a Buick. Mr. Gentry and his entire staff were friendly, helpful and very sympathetic to what had happened to us on our trip. Mr. Jim was as good as his word and about an hour and a half later (after going to a restaurant to eat our way-overdue lunch) we were on our way in the rental car to Russellville. You read about and you hear about horror stories that happen to unsuspecting travelers who encounter misfortune when a vehicle strands them in an unfamiliar place. We met with nothing but conscientious, warm and genuinely helpful people who made our ordeal a lot less painful than it could have been. Two state troopers who came to make sure we were ok and who took the time to engage my son and stay with us until more help could arrive, even though they had another call to get to; two volunteer firefighters who do what they do for no money and little recognition, one of whom has earned his retirement but still keeps on shepherding his volunteers and helping people and who gave us shade, water and stayed with us; and a car dealer who built his family business into a strong and reputable dealership by treating people with concern, dignity and respect… and no sign of stopping either. To all of them, my hat is off to you….and I would be remiss if I left out two other things too. OnStar is a service I have used several times for directions but never in an emergency. I am impressed with the way they handled my situation and the professional manner they do it. I felt much safer knowing someone was out there that knew right where we were and who to call to get us assistance. The other is our Buick itself, that knew something was wrong, did everything it was supposed to do, kept the engine running long enough to let us get off the road do and once it sensed we were stopped, shut itself off to prevent further damage. We arrived at our destination several hours later than I had planned or scheduled for but thanks to all of these people, we arrived. That is all that matters. Great story. It does seem like that when the chips are down, people will be there to help. I have a similar story of my own from a time I was in an auto accident with my sons on board in Bridgeport, Ohio, five hours away from home. Everybody knows and/or is related to everybody in Bridgeport, and it seemed like the whole town was involved in making sure we were safe and taken care of. It reaffirms my belief that there are still a lot of good people out there in the world for sure! This is such a heart-warming story. One disaster – and probable danger – but so many good things came out of it – and good people too! Yes and it all worked out and allowed us to meet some pretty nice people too! Thanks for reading!